Decorate your photos with horses! 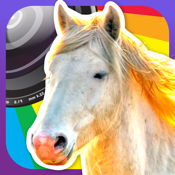 Take real-time photos with dozens of different horse images to choose from. The image is right on the screen when you take the photo. Just easily place it exactly where you want it, size and rotate it and snap away! But don't stop there! Share it by email, or onto your favorite social media site. Now that aught to get you some comments! If you have anything to tell us, please contact us at info@milkdrinkingcow.com, we love to hear your feedback! Thank you and enjoy! -Scale, rotate and re-size the horses. -Gallery within app to view your photos. -Load photos from your library. -Share your photos with social media sites right from the app.